After hotel pickup in San Jose by air-conditioned private vehicle, your tour starts with the drive out of the city to reach the Costa Rican countryside. During your experience, discover the origins of chocolate, a plant — cacao — that dates back to civilizations of Mesoamerica like the Maya and the Aztecs. With your guide, take a hike across the Tirimbina suspension bridge to a cacao plantation and through a section of forest to see the plant growing. Hear about the natural and cultural history of the cacao tree, and learn how the fruit is processed and turned into the chocolate that you eat and drink, from harvesting and fermentation to drying and milling. 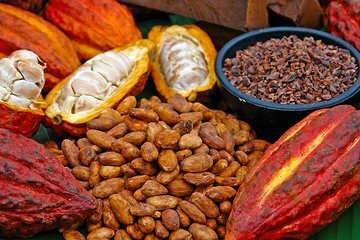 Plus, you may taste different types of chocolate, particularly organic chocolate grown by the Association of Amazilla Women of the Caribbean, a rural group dedicated to the production of organic chocolate. When your tour is over, you'll be returned to San Jose for hotel drop-off. We had a really fun time doing this chocolate tour. My wife and I were on our honeymoon and chose to do a real chocolate tour (since I'm a chocolate maker in the US) Our tour guide Mario was right on time picking us up for the drive from San Jose to the rain forest preserve where the wild life and chocolate tour began. On the way, Mario added historical information about the city and country. We even stopped for a quick view of a pineapple plantation, howler monkeys and a banana search. The chocolate tour was everything we were hoping for and more. A hike through the rain forest and hanging bridge to open and taste real cocoa fruits. Most chocolate makers I know never tried the fruit. It was really good. My wife and I had some amazing chocolate and made our own drinks. We loved it. The lunch after was great too. On the way, we saw some green frogs that were deadly to the touch. Mario made sure we didn't get too close. We just had a lot of fun and well worth the price. Thank you. I wish I could post pictures as we took a ton. This is a highly recommended tour! We got to hike into a Rainforest and actually see where the Chocolate plantation was and we learned how chocolate was made from the seed to the end product. Not only did we get to see how it was made traditionally but we also tasted different levels of the chocolate. Aside from the chocolate tour, we also stopped for a delicious lunch and also a fruit stall to see the local fruits. The tour company, Greenway Nature Tours was fantastic and our guide Gerardo was superb! This company and tour is not one to miss if you want to know more about how chocolate was made or to take their other tours.